The historic annex of the Bradford County Courthouse actually predates the courthouse itself, which was finished in 1898. On Thursday, the Bradford County Commissioners awarded a contract for the refurbishing of windows in the building. At their regular meeting on Jan. 23, the Bradford County Commissioners unanimously accepted a $35,470 bid from B.R. Johnson to replace the windows in the county building known as the Courthouse Annex and awarded the contract to the Syracuse, NY-based company. According to Commissioner Doug McLinko, the same company has previously replaced windows in the courthouse itself. “They did a terrific job here, and we think they’ll do a good job with (the annex windows) too,” McLinko stated. County Maintenance Director Kim Corbett said that the current windows and their heavy aluminum frames are outdated. Part of the reason that B.R. Johnson was accepted for the job is the company’s commitment to historic integrity. Corbett related that company representatives had not yet suggested when the work would be done, pending approval of the contract. The job should take no more than a week once it is started, he said. The work will be done in the evenings to prevent disruption of business conducted in offices there, which include the election bureau. Following the recommendation of Bradford County Correctional Facility (BCCF) Warden Don Stewart, who was not in attendance, the commissioners unanimously approved an ordinance that will fully forbid the use or possession of tobacco on the grounds of the prison in Burlington. “There will be zero tolerance for everybody,” McLinko explained. BCCF employees and visitors to the prison may not even have cigarettes or other tobacco products in their vehicles in the parking lot. The ordinance was devised primarily as another way to prevent any contraband from entering the jail, Commissioner Daryl Miller added. Daily Review reporter James Lowenstein questioned the ordinance on the grounds that tobacco is not considered “contraband” by the state. McLinko said that the county has the authority to enact its own regulations about tobacco possession, nonetheless. “The Warden asked for it, and we support him one hundred percent,” McLinko stated, adding that tobacco products have not been permitted inside the prison for as long as he can remember. Smokeless tobacco products, such as e-cigarettes, are also prohibited under Ordinance 2014-1, and anyone caught possessing such can be fined between fifty and five hundred dollars for a summary offense. Retired mental health review officer Joseph Vermilya has been contracted by the county to provide services as a mental health delegate for emergency mental health evaluations on a part-time basis. Additionally, the commissioners noted the hires, promotions and transfers, and salaries of another 14 employees, most of them at the Bradford County Manor. The next meeting of the Bradford County Commissioners will be held on Thursday, Feb. 13. A meeting of the Prison Board will follow. 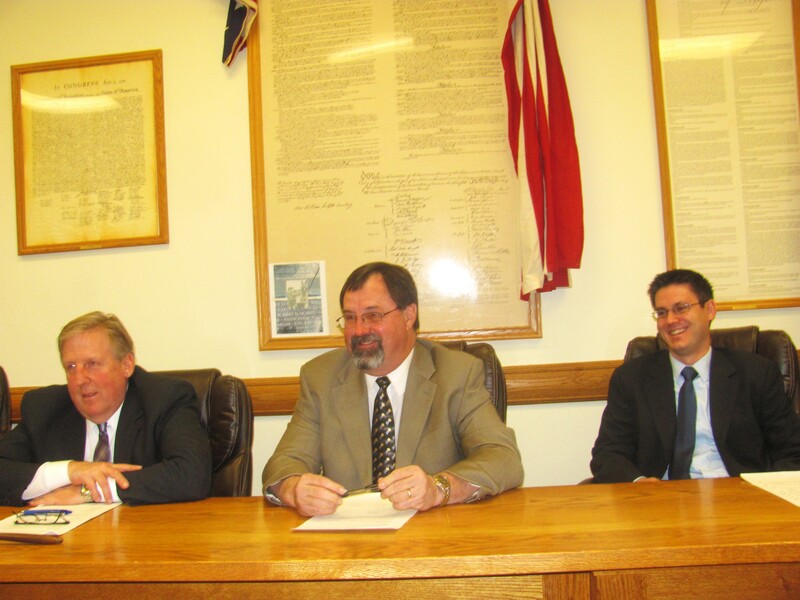 Bradford County Commissioners (from left) Doug McLinko, Daryl Miller, and Mark Smith met at the courthouse in Towanda on Jan. 23. 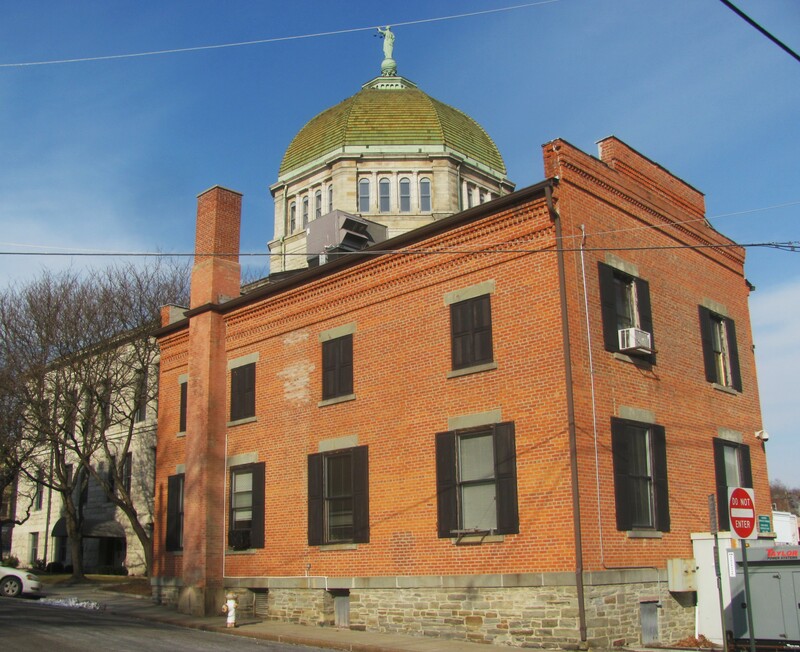 According to Matt Carl, the Courthouse Annex and a companion building were built in 1857-58 to flank Bradford County’s second courthouse building, which was constructed between 1847 and 1849 after the first county courthouse burned to the ground. The offices of the county’s prothonotary and the register and recorder were moved to the annex and then back into the present-day courthouse that was built in 1896-97. In 1903, the county invited the Bradford County Historical Society to occupy The Annex, where the county’s first museum was opened. “The museum remained there until it outgrew the building and moved to 21 Main Street in 1974,” Carl related, adding that the county once again needed the extra space and moved its Department of Elections, human resources office, and computer and technologies department into the building. The second building was used for many years as Towanda’s fire station and was torn down in the early 1900s. Correction – The courthouse annex was built in 1857-58. The contract for the second courthouse was made in 1847 and it was occupied in 1850.